es... and, with great accuracy. You'll see how calculations based on the Fibonacci number series can be applied to stock prices for startling results. Applied correctly, support and resistance levels will materialize. Likely turning points will present themselves, clearly. So, how are the retracement percentages derived? Now, you have a number series which goes on forever. "How are Fibonacci percentages applied?" Begin by locating isolated highs and lows in a trend. The various swing points will be used to measure the retracements. Counter-trend BC is a 50-percent retracement of trend AB. Trend CD continues in the same direction as trend AB. 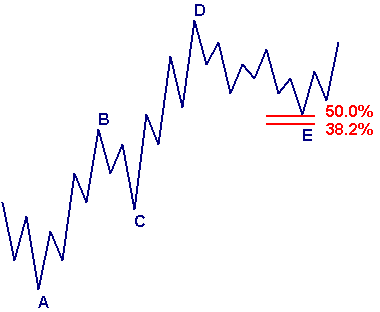 Counter-trend DE is a 38-percent retracement of trend CD. Shallow retracements are typical in a strong trend. 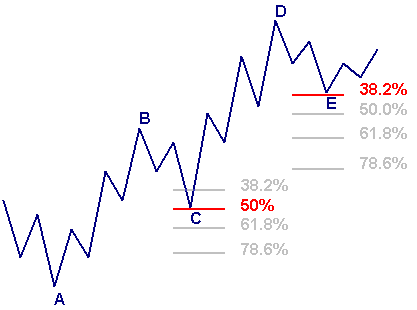 The 38-percent retracement is calculated from trend AD. The 50-percent retracement is from trend CD. When retracements from different swing points cluster together it is known as confluence. Areas of confluence are likely turning points. So far, you have seen how to calculate probable retracements using the high and low swing point of an established trend. 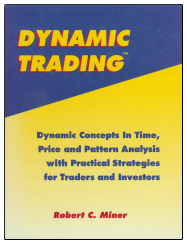 You can use Fibonacci percentages, in combination, to forecast the end of a trend... with excellent results. 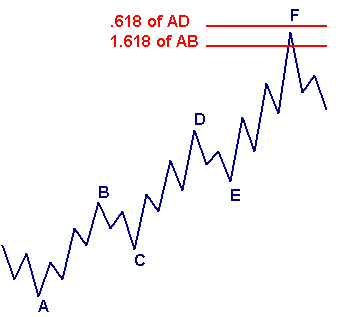 First, trend AB is multiplied by 1.618 and then added to itself... forecasting a target price at point F. Next, counter-trend BC retraces part of trend AB before continuing on. Finally, trend AD is multiplied by .618 and added to itself. This projection also forecasts the trend termination at point F. Incredibly powerful! In a five-wave pattern, this ratio combination will bear-out turning points, again and again.